According to the Town and Country Planning Act 1990 National Planning Policy Framework must be taken into account in making planning decisions. 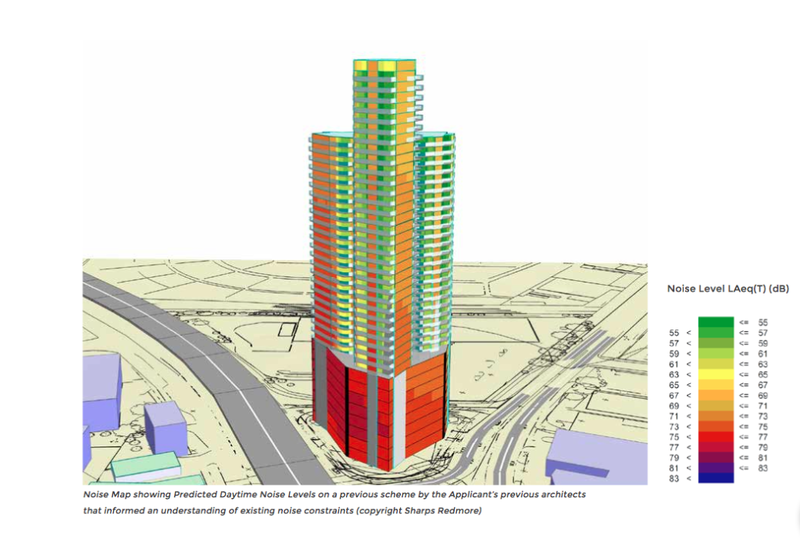 The current planning application for a 32-storey skyscraper at Chiswick Roundabout (dubbed The Chiswick Curve) is unsustainable. It lacks provision for infrastructure, it utterly fails to support “strong, vibrant and healthy communities” by providing suitable housing – by no stretch of the imagination could living on the Chiswick Roundabout be described as healthy – and it has no “accessible local services that reflect the community’s needs and support its health, social and cultural well-being”. Finally it makes no contribution “to protecting and enhancing our natural, built and historic environment”. For all these reasons the application is unsustainable, thereby infringing para 7 of the NPPF. Paragraph 32 of the NPPF states that “Plans and decisions should take account of whether safe and suitable access to the site can be achieved for all people”. Access to this site is very difficult for motorised traffic, and most residents will not have car parking space, nor should they be encouraged to use their cars. All other access is via foot or cycle only by crossing at least 4 lanes of fast moving traffic, through a highly polluted roundabout at the junction of the North Circular and several main roads, and beneath the four lanes of the A4. It is ludicrous to suggest that this is a suitable site. The nearest tube station is Gunnersbury, where local residents are already asked to avoid travelling during rush hours as the station is overcrowded to the point of unsafety. Development can, according to para 32 of the NPPF “be prevented or refused on transport grounds where residual cumulative impacts of development are severe.” This is such a case, both on its own, and even more so when taken in conjunction with the Brentford Football Stadium and its associated 900+ flats. Paragraph 35 of the NPPF requires “access to high quality public transport facilities; create safe and secure layouts which minimise conflicts between traffic and cyclists or pedestrians.” This development contravenes this requirement. Paragraph 38 states that, especially within large developments, such as this one “key facilities such as primary schools . . . . and should be located within walking distance of most properties.” This application contravenes this requirement. A child living in this proposed property would not only have a very long distance to walk to the nearest school, but would be doing so across many lanes of crowded traffic, in a highly polluted atmosphere. While these flats are not aimed at families with children, by the laws of nature, they will inevitably arrive. Paragraph 58 states that developments should aim to “establish a strong sense of place, using streetscapes and buildings to create attractive and comfortable places to live, work and visit; respond to local character and history, and reflect the identity of local surroundings and materials.” There is nothing in the Local Plan’s analysis of character and history that in any way presents a 32 storey glass skyscraper as appropriate. Far from responding to local character and history, this development would dominate the surrounding conservation areas, and indeed establish its own sense of place in conflict with its surroundings, which would be irrevocably altered by the dominance of this building. Paragraph 61 states that a new development “should address the connections between people and places and the integration of new development into the natural, built and historic environment.” The developer’s claims that the colouring will reflect the river reflections only serves to demonstrate how the building will overshadow the area, not just in the immediate vicinity but from as far away as the river (in contradiction to the Thames Strategy – Kew to Chelsea), Kew Gardens (UNESCO world heritage site) and indeed for some ten miles around. This is relevant, even before one adds into consideration the 25 metre advertising screens that will shine out from the building in several directions. Paragraph 66 requires applicants to take account of the views of the local community. 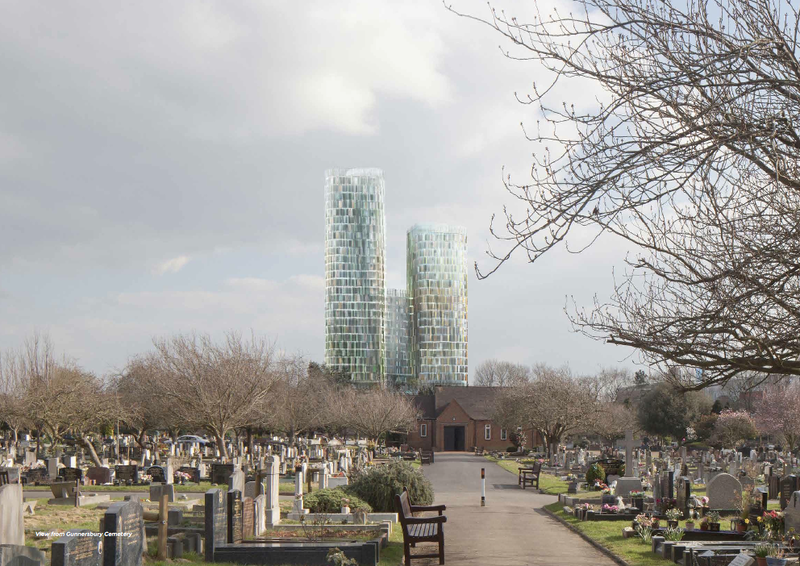 While pre-application discussions have been held with the planning department of Hounslow Council, these do not reflect the views of the local community, which have been very hostile. A PR exercise carried out by Starbones in Brentford cannot be considered representative. The hostility shown by all Chiswick councillors, and all local Chiswick societies, along with representatives from Kew, Ealing and Brentford reflects a more accurate view of local opinion. Paragraph 67 says that “Poorly placed advertisements can have a negative impact on appearance of built and natural environment.” The enormous advertising screens on this building will do just that. Paragraph 109 says that planners should “prevent both new and existing development from contributing to or being put at unacceptable risk from, or being adversely affected by unacceptable levels of soil, air, water or noise pollution.” This building will be situated in one of the most heavily air polluted sites in London, possibly in Europe. All along the A4 in Hounslow is subject to disastrously high levels of air pollution. The offices at the level of the A4 will have the highest levels, while the penthouses will be less polluted. The architects say that all windows will be sealed shut and “fresh” air drawn in from the roof. Meanwhile government health policies encourage fresh air activity. Sealing the new residents and workers of this building into a hermetic pod because of the toxicity of the surrounding air is no way to live or work. Paragraphs 128 and 129 state that local heritage assets should be considered. Kew Gardens, Gunnersbury Park, Strand on the Green, Kew Bridge are just a few of the heritage assets that will be adversely affected. Paragraph 154 states that new development should be “plan led” with the Local Plan offering clear guidance. The Local Plan for Hounslow was only adopted a few months ago, and there is a clear prescription against high rise buildings. This development also infringes key elements of the London Plan of March 2015. The level of habitation is too dense – for instance para 3.30 notes that where public transport is limited, densities should be lower. It infringes the requirement for children’s play space (“ensure that all children and young people have safe access to good quality, well designed, secure and stimulating play and informal recreation provision, incorporating trees and greenery wherever possible”, Policy 3.6). According to Policy 3.16 “Boroughs should ensure that adequate social infrastructure provision is made to support new developments” – not only is there no consideration, eg for enough schools for these new residents, but eventual schools risk having to be built on open space (thereby contravening policy 7.17). We have already seen this narrowly averted with the recently defeated proposals to build a new school on Brentford Rec. No schools, no open space in this development. Policy 7.4 of the London Plan, part A requires that “Development should have regard to the form, function, and structure of an area, place or street and the scale, mass and orientation of surrounding buildings. It should improve an area’s visual or physical connection with natural features.” It would be ludicrous to suggest that this was the case with the Chiswick Curve. 7.4, part B c states that development “is human in scale, ensuring buildings create a positive relationship with street level activity and people feel comfortable with their surroundings.” Any attempt to claim that a building of 32 storeys that bulges out from its tiny footprint to lean over a surrounding roundabout and dual carriageway, while shining out large adverts for miles around, would be ludicrous. Claims by the developer that the public realm at ground level will be enhanced should be treated with great scepticism. The footprint of what will be left after the 3-fold towers are built on this small site is negligible, so there is very little public realm left; what little there will be is virtually under the motorway, at the foot of these huge towers, and isolated on a tiny island with two-lane traffic all around. Policy 7.7 states that tall buildings should “generally be limited to sites . . . . that have good access to public transport, only be considered in areas whose character would not be affected adversely by the scale, mass or bulk of a tall or large building, have ground floor activities that provide a positive relationship to the surrounding streets, incorporate publicly accessible areas on the upper floors where appropriate, should not affect their surroundings adversely in terms of microclimate, wind turbulence, overshadowing, noise, reflected glare, aviation, navigation and telecommunication interference, should not affect their surroundings adversely in terms of microclimate, wind turbulence, overshadowing, noise, reflected glare, aviation, navigation and telecommunication interference, and should not impact on local or strategic views adversely.” It is hard to see where the Chiswick Curve would not impact on nearly all of these. For instance it will overshadow the entire area around it, it will give off great reflected glare not only from its own glass surfaces but also from its huge advertising screens, it will impact on local views over Gunnersbury and the river, let alone from Chiswick and Brentford. Policy 7.10 requires that “Development should not cause adverse impacts on World Heritage Sites or their settings”. Kew Gardens will be adversely impacted. Policy 7.14 requires that “Development proposals should minimise increased exposure to existing poor air quality”. All residents and workers at the Chiswick Curve will experience increased exposure – not only by living or working there, and certainly by trying to arrive or leave from the site. Surrounding areas will be affected by the increased traffic and congestion caused by this development at what is already a very congested junction. There are no similar tall buildings in the area – the Chiswick Curve would be some 20 storeys higher than anything in the area. The Chiswick Curve development infringes many aspects of the National Policy Planning Framework, the London Plan and Historic England’s Tall Building Advice and should therefore be rejected.